Angela Wallis completed a three year Bachelor of Science degree in Acupuncture from the International College of Oriental Medicine in East Grinstead. As well as providing rigorous training in Chinese medicine, the College prides itself in teaching students all aspects of Western medicine. Angela is therefore well-versed in understanding and treating modern health complaints. As well as being trained in Five Elements and Traditional Chinese Medicine-style acupuncture Angela is also qualified in Stems & Branches. Angela’s own life experience has led to her having specialist areas of treatment. These include fertility – as Angela has undergone IVF treatment herself and pain management – after experiencing sports injuries which led to sciatica, neck and shoulder pain. 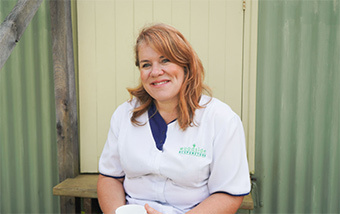 Therapist Angela is also trained in therapeutic massage (combining Sports, Swedish and deep tissue massage techniques), cupping and Gua Sha – all of which are used in treatments to get the best possible outcome. Angela specialises in gaining a comprehensive assessment of a patient's health history and then recommending the most effective and beneficial treatment methods to enhance and reinstate health and well-being. Angela is a fully insured member of the British Acupuncture Council, the regulatory body for qualified acupuncturists in the UK. Woodside Acupuncture & Massage Clinic is open every Tuesday, Wednesday, Thursday and selected Saturdays. 58 High Street, Polegate, BN26 6AD (located within Team Hair & Body - free parking on the high street and nearby at Polegate Station). For appointments please call 01323 819 157.